A strong cold front pushing through the Great Plains earlier this week produced lightning that ignited several fires in Texas, Kansas, and Oklahoma. The Visible Infrared Imaging Radiometer Suite (VIIRS) on the Suomi NPP satellite captured this natural-color image of fires raging in all three states at 1:00 p.m. local time (19:00 Universal Time) on March 7, 2017. The red outlines are areas where the satellite detected heat signatures indicative of active burning. 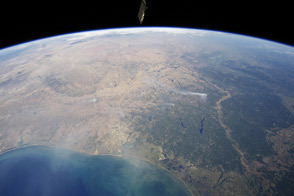 Smoke from large fires in the Oklahoma and Texas panhandles was visible streaming toward the southeast. 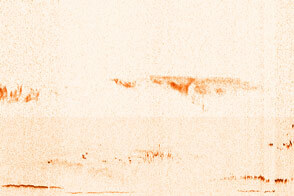 The large pall of smoke over West Texas likely came from the same group of fires. 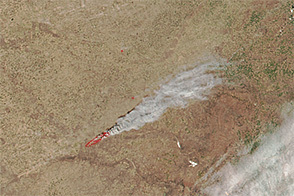 Low-level winds caused smoke produced on March 6 to curl back toward the west, explained NASA researcher David Giles. The smoke has affected a broad area. After tweeting a smoky photo of El Paso, University of Texas scientist Tom Gill noted that levels of fine particulate matter (PM2.5) were about 500 percent of the local average. Meanwhile, the fires have burned more than one million acres and taken seven lives, according to CNN. 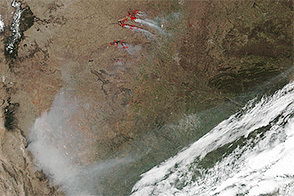 Winds pushed a plume of smoke from wildfires burning in the Oklahoma and Texas panhandles back toward West Texas. 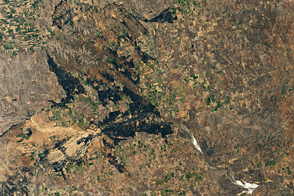 Several fires raged through Oklahoma and Kansas in March. CNN (2017, March 7) Wildfires burn more than 1 million acres, taking 7 lives. Accessed March 8, 2017. NASA (2017, March 8) More Smoke in the Midwest US. Accessed March 8, 2017. National Weather Service (2017, March 7) Smoke from Texas Panhandle Wildfires. Accessed March 8, 2017. OAOnline (2017, March 7) Winds push wildfire smoke over West Texas. Accessed March 8, 2017. Oklahoma Forestry Services (2017, March 8) Fire Situation Report – March 8, 2017. Accessed March 8, 2017.